I just would like to add these about Geoff and Tisha. Geoff Rodriguez is a Filipino-Australian model, TV host and actor. Tisha Silang, a Filipino-Canadian, is a former Miss Philippines-Universe but dethroned, TV host and model. Rovilson Fernandez, TARA2 runner up, admitted in an interview that Geoff auditioned for TARA3. "When asked who else he would race with if he could do it all again, it doesn't take long for him to answer. "I'd probably go with Ernie Lopez (The Amazing Race Asia Season 1 contestant), because I've raced with him before and I had the best time racing with Ernie. We've done adventure races together. I just have so much fun with him. We have the same mentality. And also probably Geoff Rodriguez, he's another one of my best mates. He auditioned for Season 3. He's just like us: he's a carbon copy of Marc basically, well as far as the humor is concerned. Lastly, it would basically be a Malaysian girl, only because, if you look at the history, the Malaysian teams in season 1, they won and here in season 2 they took 2nd and 4th place. Malaysian women are tough. They're fantastic and they're nice to look at," he says with a wink." Tisha Silang also expressed in an interview about her desire to be a part of the Amazing Race. "We also hear you're quite the reality TV show junkie. Yes! Thursday nights are bad coz there's American Idol, Outback Jack, Growing Up Gottie, and so I'm switching channels the whole way! I've also watched The Bachelor, even Fame! 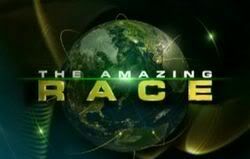 The Amazing Race is also one of my favorites. I actually did research on the show because I have a friend, and we would have been a perfect match for the show. But then it's only open to American citizens, so, aww. " "You think if you joined The Amazing Race, the camera's gonna get a shot of a bitchy streak? Definitely, I'm such a competitive person, if I say I wanna do one and my partner doesn't agree, we'd end up on each other's throat! Plus I don't know how I'd be, having to get up that early and lug all my stuff around on my back! I mea, as it is, I tend to miss a lot of fights already, ha ha! I would be entertaining for people to watch that way! " We are still working on another team. Hopefully, we can break the codes soon. I got a mail (sounds like a Hollywood movie) from our Saigon blogger. Thanks Cami for your kindness. Saw your message on my blog. Don't know how much I can tell you though because all we saw were a couple of teams running in and out of the bar we were yet and in and out of the hotel across the street......Apparently someone asked the film crew what they were shooting for and they replied that it was for a bollywood movie! Maybe they were just kidding because we saw the red and yellow flag/sticker on one of the team's backpacks. What could be the task?? Transport something from the bar to the hotel?? I hope to hear more from Cami. Great she noted the yellowflag/ sticker, thanks again JonLover. Maybe they were lost and looking for directions? I dunno? If you have other things to ask, you can send it to my PM or my e-mail and try to get an answer from her. She's nice. Did you ask the date of the sighting JonLover? Taken on May 29th found at flickr , Hong Kong I assume. eta: its not a team but a cameraman? tagged: "Doubtful " The Amazing Race" Enroute point"
The poster said he saw two beautiful girls(or women) on the street and finding taxi today(29-5-08 HKT),he also saw a flag of amazing race(which is in yellow & red), at first,he saw them opening a clue,then jumping up to the taxi, TAR13 have already finished shooting,so it's probably TARA3!!! 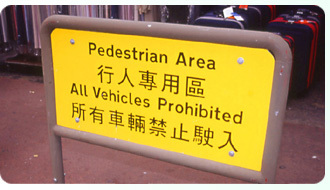 Only the below streets on Mong Kok have the signs. Eliminate intersections with Argyle St (it has four lanes), and what are we left with? if i have any news,i will post it. Thank you for checking again kaad! Due to computer problems, I have not been here in so long! And now, we have a new version of TARA to keep track of. I can't wait to see this. If the mactor trend continues (as it appears to have), I'm very sad to see this happen. But great detective work as usual. Thanks to the TAR Detectives for keeping us up to date. I found this photo when I do the search for TAR13 in Picasa! Wow! Schwartzmoor! You are on a roll! 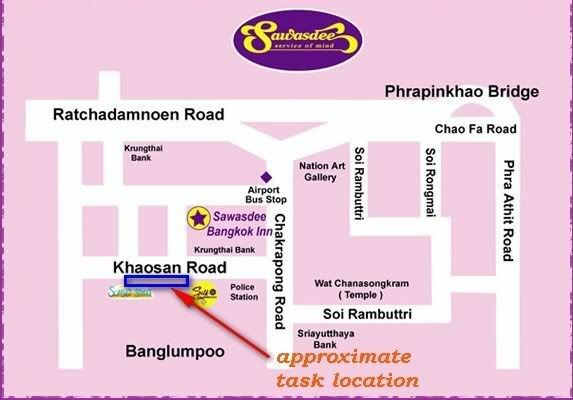 Thanks to that, I think I can finally localize where on Khao San Rd the task took place! oops, sorry puddin, I forgot about that one too! I think they are done filming ARA3 since I saw McKay answering messages from fans in his corner just today. Though this is not a concrete basis, I have a feeling they're really done. 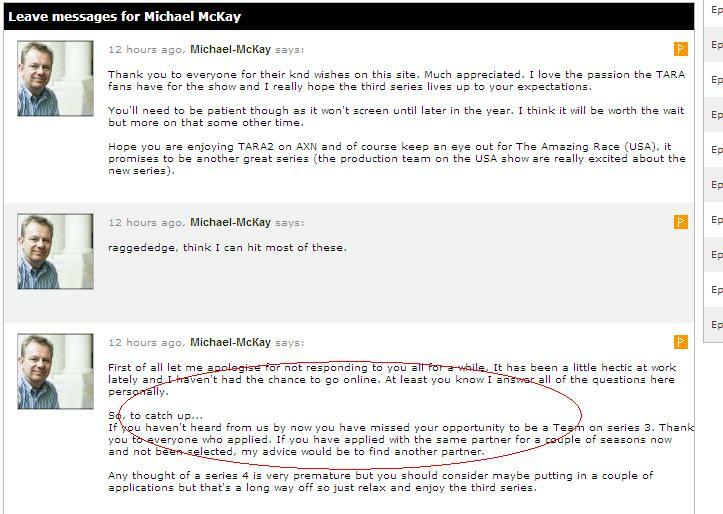 Mckay loves to answer posts from fans for the last two months almost thrice a week. He stopped doing it around 12 May but resurfaced again today. Hope you are enjoying TARA2 on AXN and of course keep an eye out for The Amazing Race (USA), it promises to be another great series (the production team on the USA show are really excited about the new series). It is theoretically possible for ARA3 to have begun May 8 in Dubai. However, that means that episodes on average would commence May 10, 12, 14 and 16 before hooking into the known schedule of Bangkok/Beijing, Baijing/Bangkok, Chiang Mai, Saigon, Hue, Hanoi. That could mean the race finished in Hanoi after 11 episodes, which does not square with more recent information. Starting ARA3 while AR13 was still filming would have been an excellent way to avoid scrutiny, as we were focused on figuring out the ending of AR13. However, I don't think that started that early but that is just a personal assessment. Well I'd hate to think that TA3 is following in the footsteps of USA TAR. IF the race started on May 17th/18th and the race ended last week (last known sighting on teams May 29th HK) .........could it be they are following our/USA format of 11 episodes instead of the usual 13 and running 20 plus somedays instead of the 28 -30plus days? Page created in 0.083 seconds with 32 queries.